I devoured the “Slutty Burger” (The Big Bon pictured above) , a stacked burger with a large beef patty, cheddar cheese, fried sausage, tomatoe, bacon, and chili. It came with potato wedges, some sauces and grilled onions. As I devoured this Tianjin original masterpiece and lost all spacial and mental awareness, I took a journey into pure Bon Burger bliss. And while maybe I’m being a little dramatic with the culinary experience, what I’m trying to say is it was really, really good. 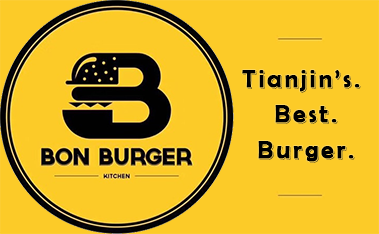 The prices are the best you’ll find in Tianjin considering the quality, the taste, atmosphere, and style all placing Bon Burger directly in the conversation for Tianjin best burger. A small, comfortable location with neighboring Tianjin favorites Scugnizzo (Heping) and Le Loft both a very short walk away, Bon Burger is a complementary addition to what is shaping up to a be a foreigner hotspot. A must have burger joint that I’m looking forward to visiting as often as my waistline allows. Really nice place but really small. The taste of the food is nice but could be better. These were the best burgers my friend and I had! Really great quality food, interesting atmosphere. Although the space is small but there is interesting cuteness in it! We both loved it! Definitely a place to come back to! very good taste and service,and you can listen the very great old style rock music there, a good place for you and your friends to spend time.